Well, this one led us a merry dance and no mistake. 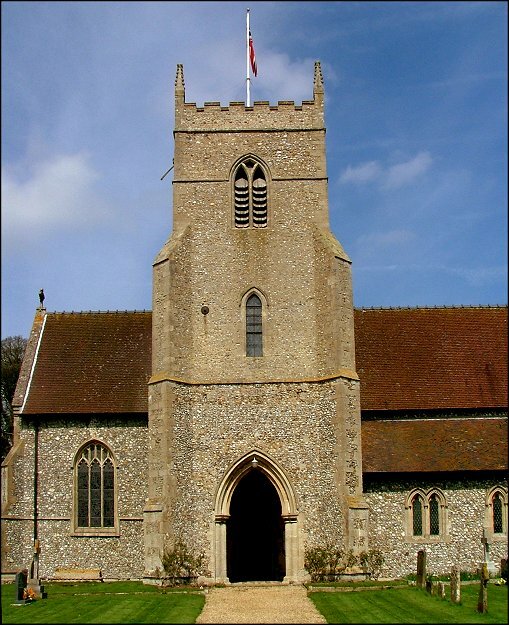 In the Walsingham area, you just assume that all of the churches will be open, because just about all of them are, as if Our Lady had stretched out a hand and touched the hearts of the area's churchwardens. Even in the most remote places, the doors are unlocked - many are actually wedged open as if to welcome you into the house of God. 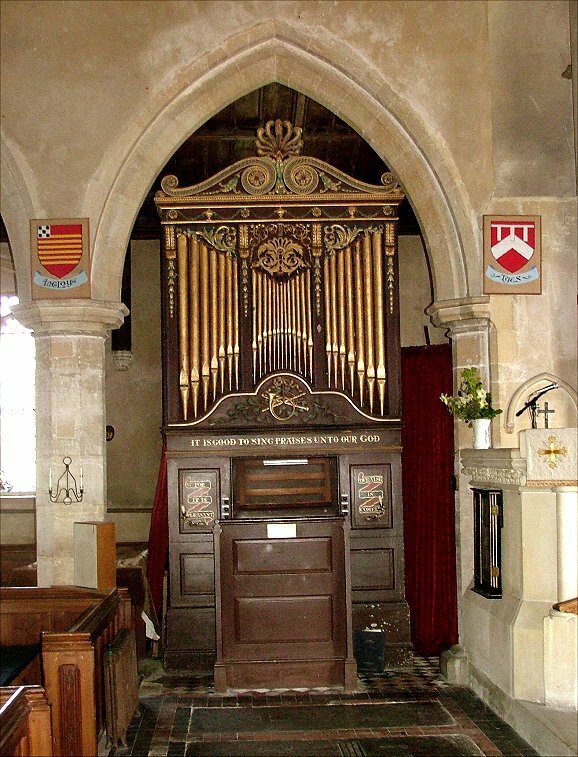 It was with some surprise, therefore, that John Salmon and I arrived at All Saints, Sculthorpe, to discover that it was not only locked, but that there was no keyholder notice. Indeed, there did not even appear to be a keyhole on the main doors. 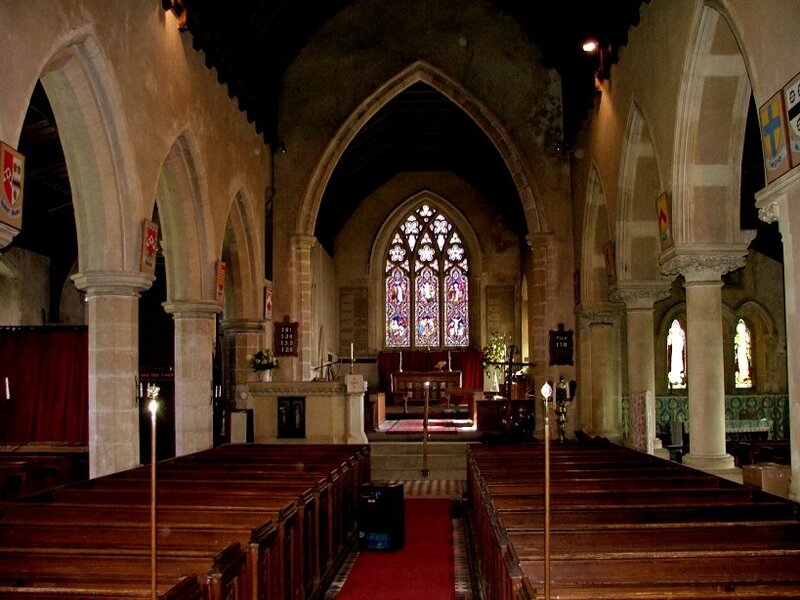 Now, there can be no possible reason for this church to be kept locked. All Saints is in a busy little village with plenty of eyes around to keep tabs on what is going on. 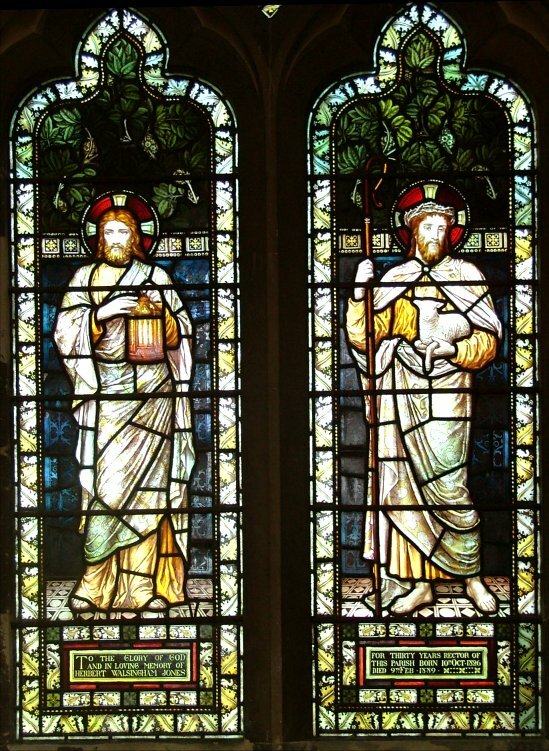 The chief treasures of the church are a fine collection of late 19th and early 20th century glass and a solid Norman font, neither of which are made more vulnerable by pilgrims and strangers stopping by for a spot of spiritual refreshment. 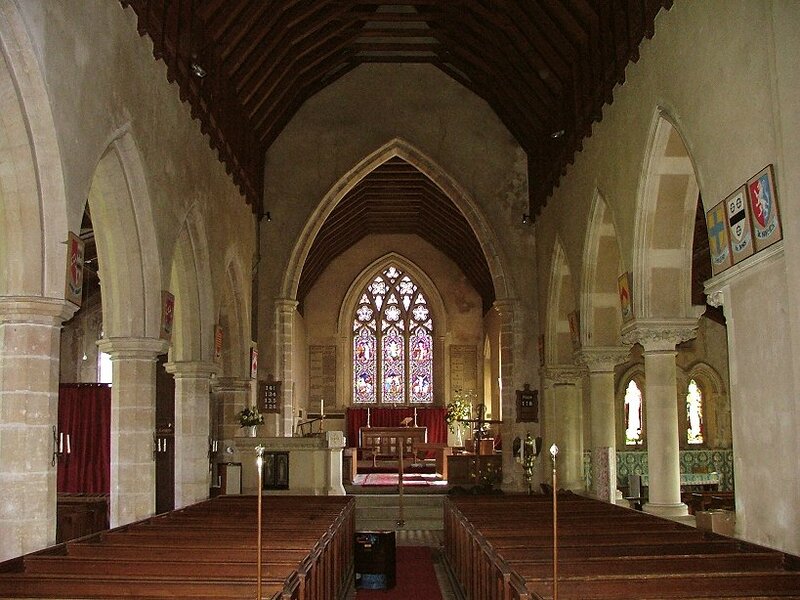 Perhaps the churchwardens of Sculthorpe are particularly steely-hearted, but It must be embarrassing for the poor Rector of South Creake, into whose patch All Saints falls. 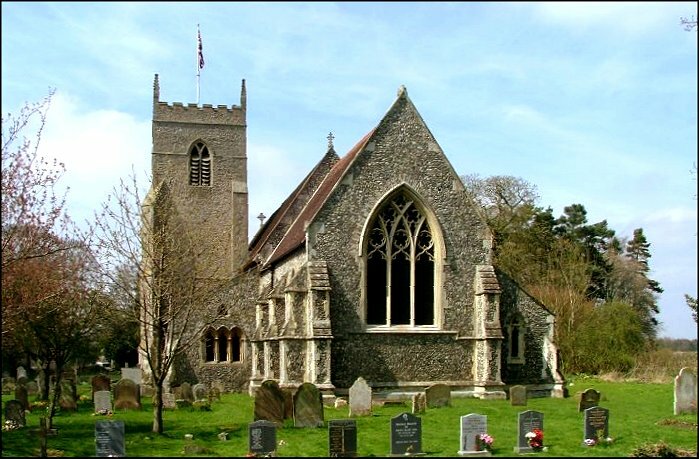 South Creake is perhaps the most welcoming church in Norfolk, but when it comes to churches being open it is the churchwardens who call the tune, not the Rector. 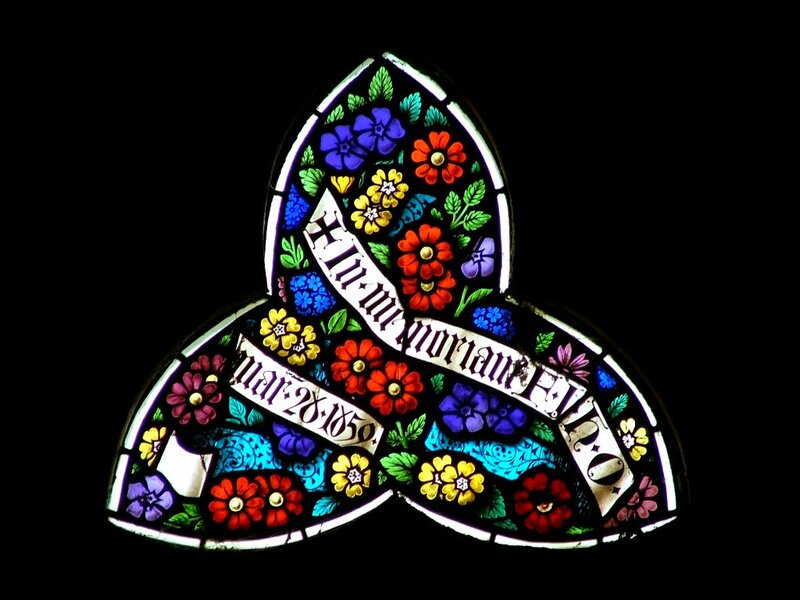 There was a notice giving the Rector's name and address in the porch, and someone had scribbled in biro on it to get the key and a telephone number. At first, I assumed it had been another pilgrim or churchcrawler who had done this, but then it occured to me that it was probably the long-suffering Rector himself. I called the number, and a very nice lady answered. She didn't have a key herself, but she gave me a set of directions to the house of the churchwarden who did. Now, I won't say that the directions were complex, but if you call her yourself I suggest you have a pen and notebook handy. There were lots of left turns and right turns and vague mentions of main roads and a row of old cottages, but the bit I remembered was that there was a modern house at the end of it all. We set off, and my version of the instructions rapidly deposited us two miles away on the Fakenham bypass. We headed back to Sculthorpe, entering it by a different route, and were pleased to discover a row of old cottages with a modern house at the end. I knocked on the door. No answer. At this point, the only sensible thing was to phone the nice lady again. When I told her where we were, there was a pause, followed by exasperated laughter. "For goodness sake!, you're meant to be right near the church!" she said, amazed. She then gave me another set of directions which were necessarily even more convoluted, given how far out we were. 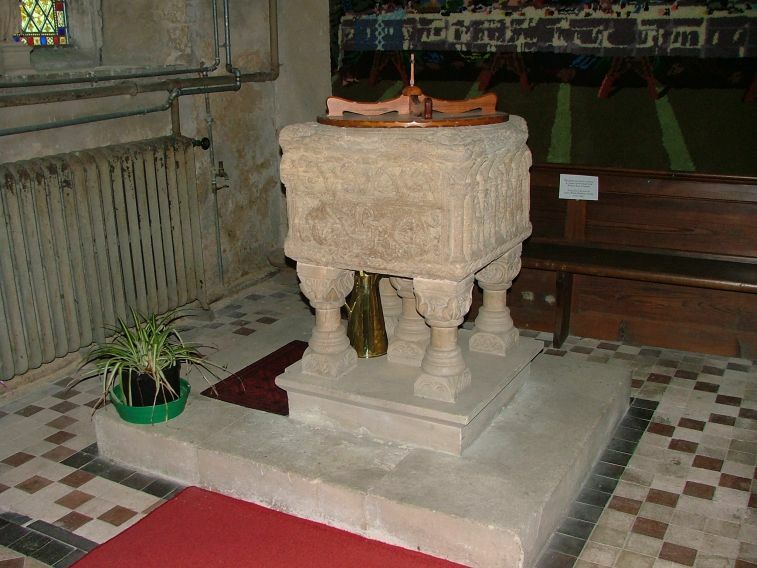 I didn't remember all of it, but it seemed to include an old chapel and some allotments, going out of the village, twice more round the Fakenham bypass, through the car park of Morrisons, along the new M6 toll road and then around about two thirds of the Paris peripherique. Eventually, we arrived back in Sculthorpe again. Now, John is a careful and meticulous driver, who plans church visits precisely with the aid of a street atlas and an on-board satellite navigation computer. I could see that another phone call and a new set of directions was likely to drive him mad. So when he suggested that we simply knock on the front door of every modern house in Sculthorpe I was ready to agree with him. However, we suddenly noticed some allotments, and then there was a row of old cottages and a modern house. We came to a sharp halt, and I leapt out and knocked on the door. A very nice lady answered. She didn't have the key. She was very sorry, but her husband had taken it out in his pocket that morning. When would he be back? She didn't know. But we could go and get it off him. Where was he? 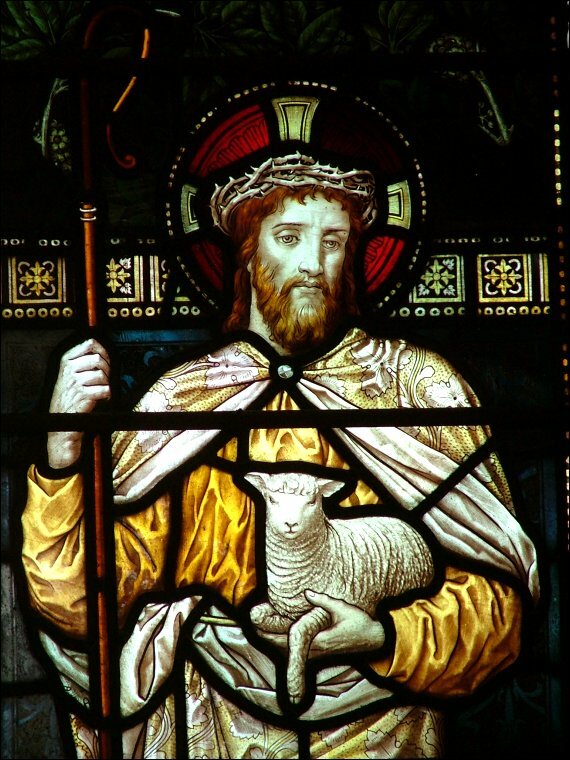 He was in the churchyard, cutting the grass. We set off back to All Saints, to find the churchwarden cutting the grass immediately outside the porch. I asked him for the key. 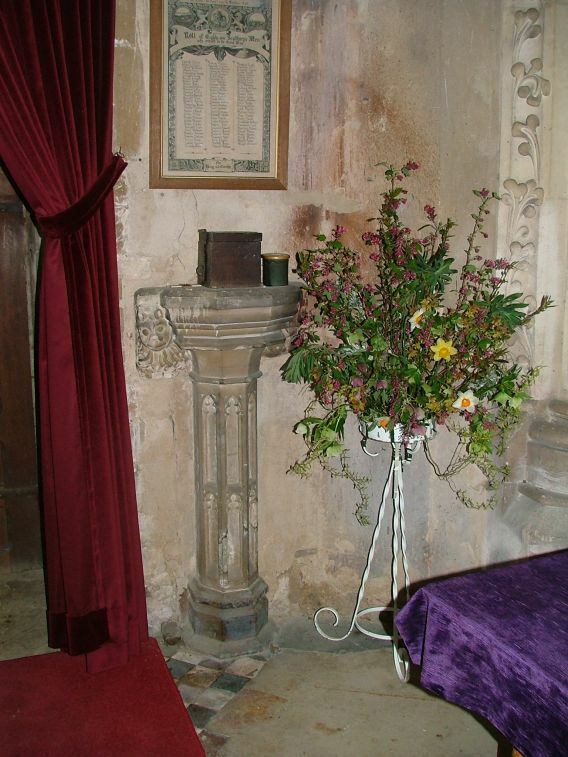 He thought about it for a very long time, and then let us in to the little doorway at the west end of the south aisle adjoining the porch under the tower which is on the south side rather than at the west end (come on, keep up). 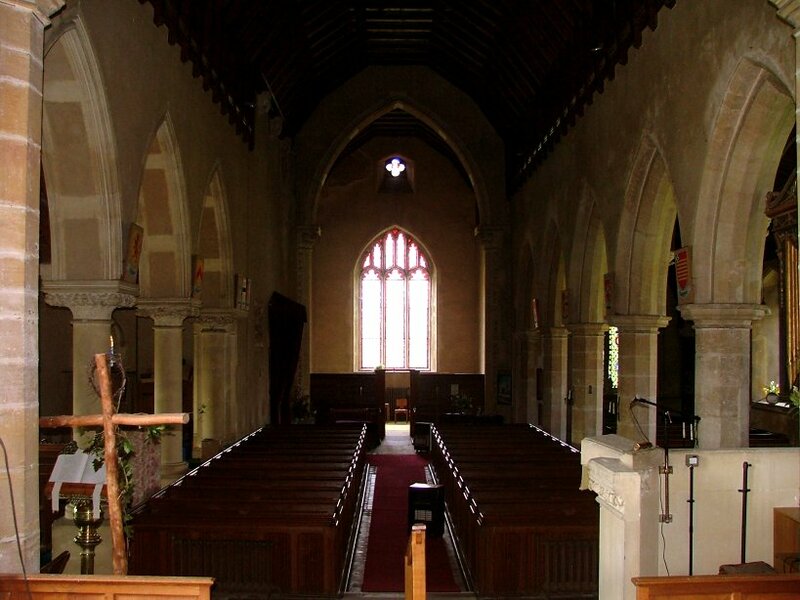 At last, we were inside All Saints. And it was well worth it. The church itself is almost entirely Victorianised - indeed, it is safe to call this a Victorian church set against a late medieval tower. 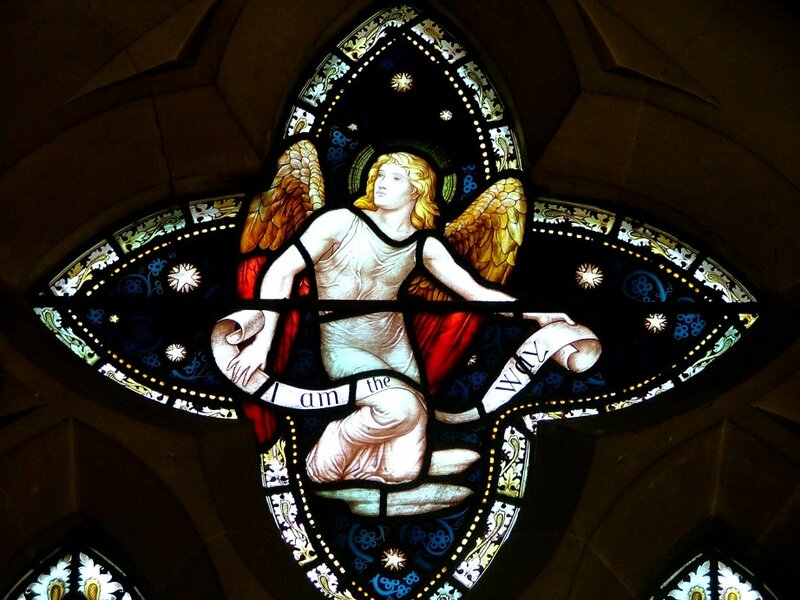 Only the north aisle is old; the Decorated chancel is the work of Richard and James Brandon, who I have not hear of, and Pevsner claims the unusually early date of 1846 for a restoration quite so articulate. 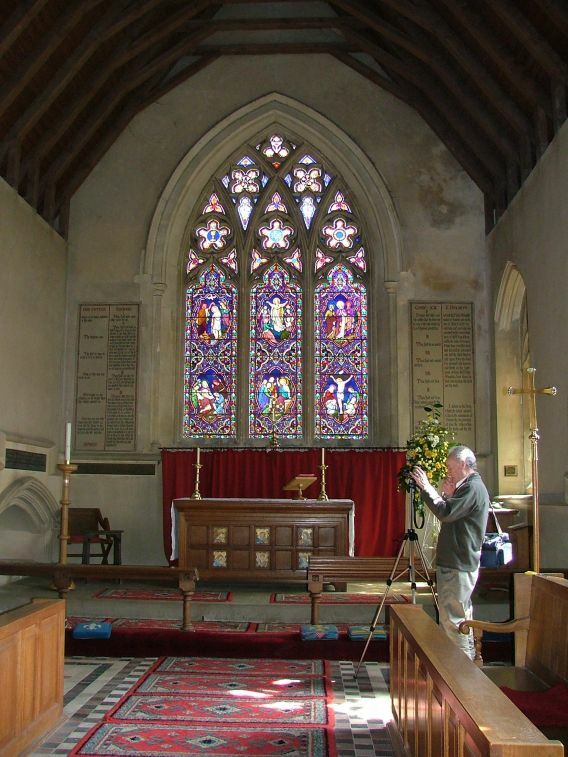 The south aisle is by the more famous Thomas Jekyll, who we had met earlier in the day at Holt Methodist church. He indulges himself here again in his enthusiasm for Early English. 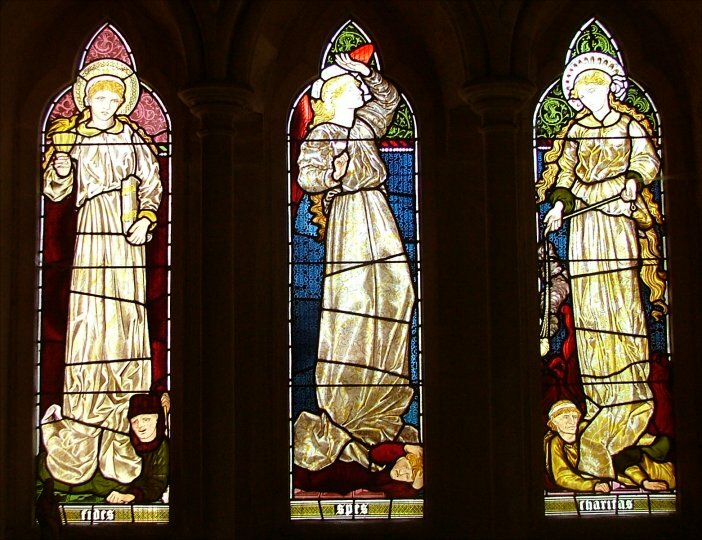 The building is saved from mundanity by an excellent range of glass, including the work of the William Morris and Heaton, Butler and Bayne workshops. 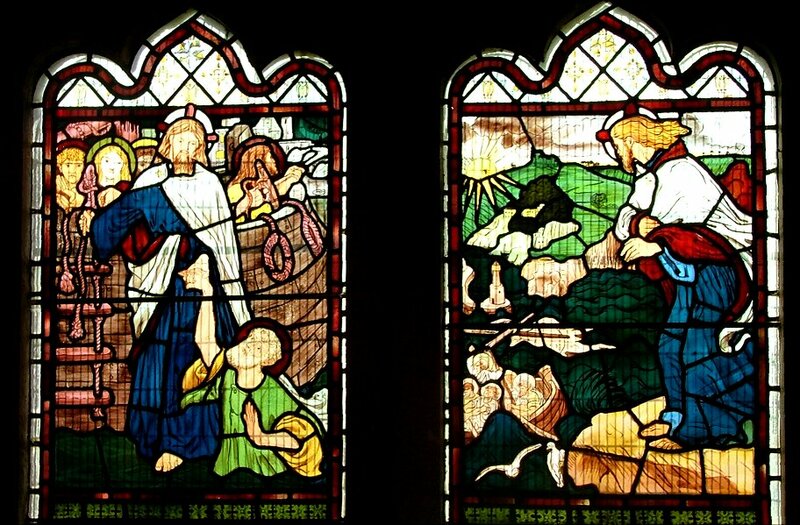 Highlights include Ford Madox Brown's Christ on the Water for William Morris in the sanctuary, and the Faith, Hope and Charity windows in the south aisle, which I think may be by Burne Jones for the same workshop - there is something similar at Langham. 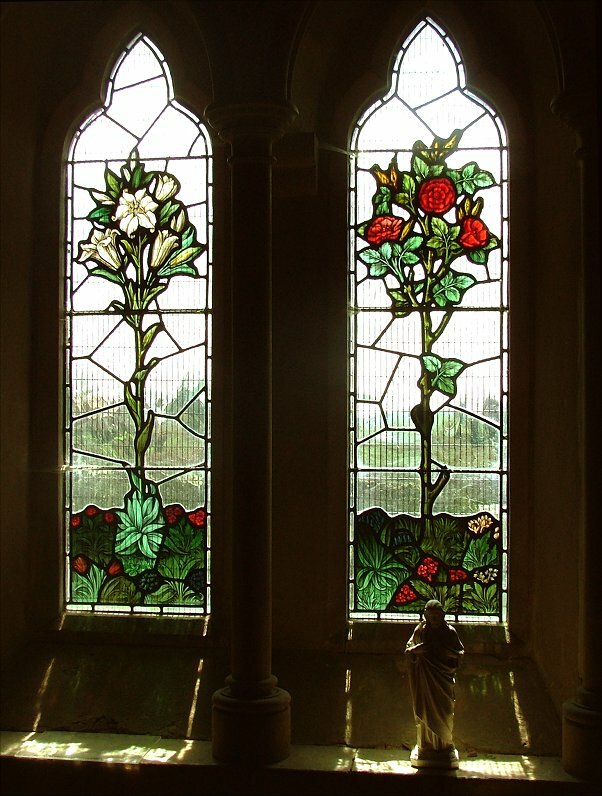 There are a couple of superb floral windows, and famously Robert Bayne's signed window of the story of Ruth in the south-west corner, although I did not think much of this. 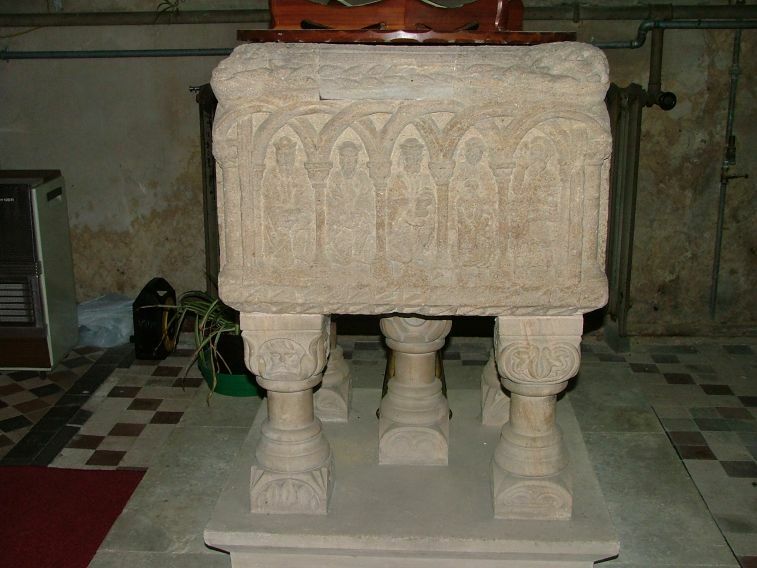 Norman fonts so often earn the epithet primitive, but the one here most certainly isn't, in an area of rich and complex Norman fonts. 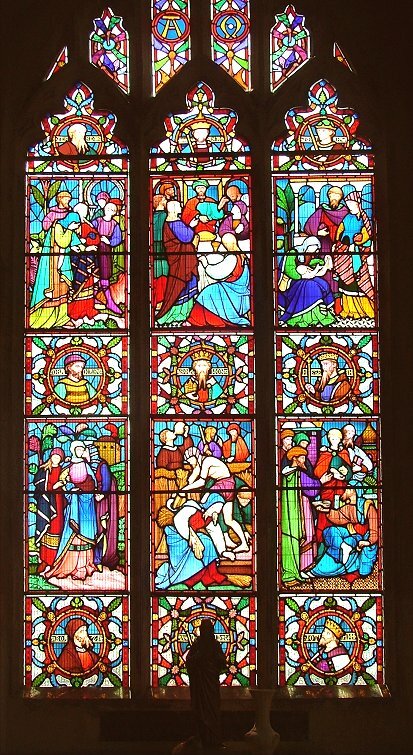 On the east side, five panels appear to show the Adoration of the Magi, and the other sides have elaborate patterned carvings. 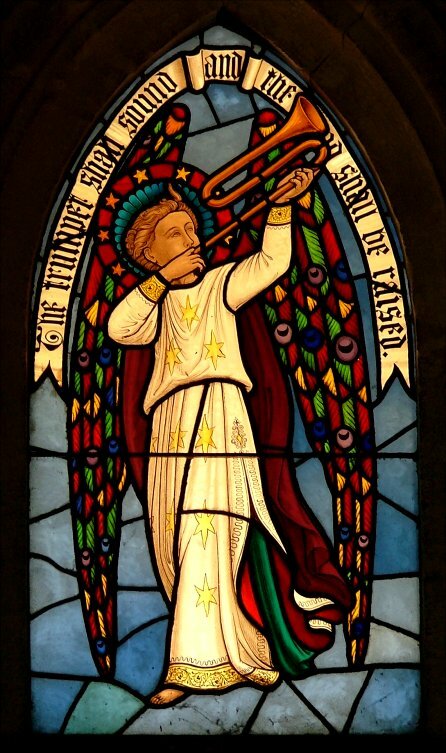 It is worth noting the association of the Magi with Baptism in the early Christian mind. The visit of the Magi is the Epiphany of the gentiles, that they too were called to be followers of Christ, that he wasn't just there for the Jews. 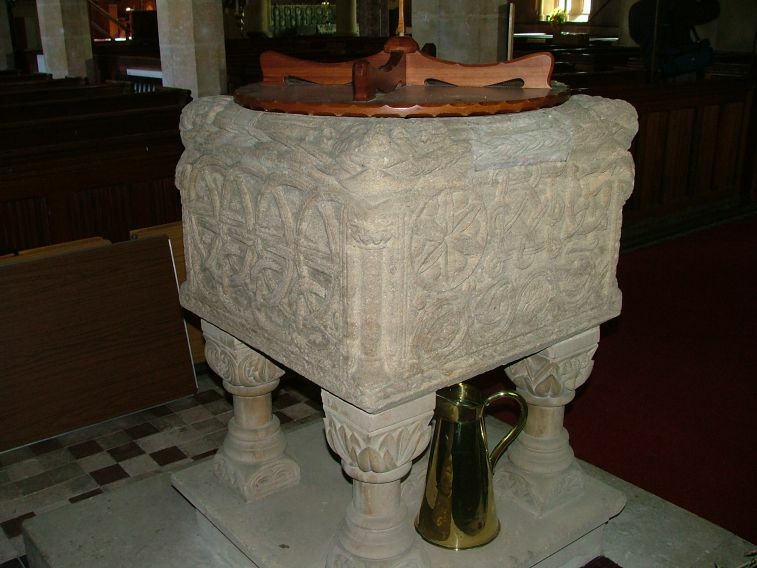 It was not necessary to be circumcised first to be a Christian (a point that is debated in Paul's letters) but that the font itself was the beginning of the Christian journey. 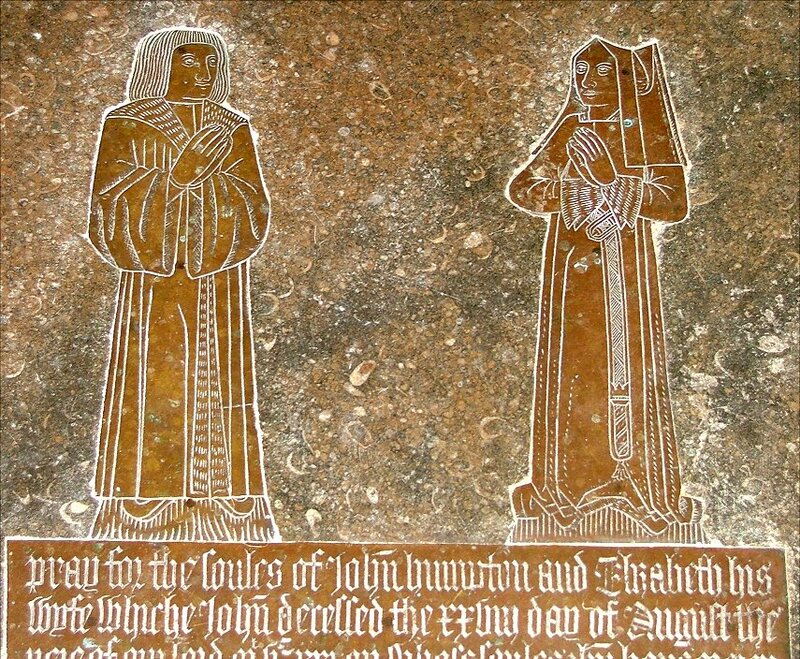 In front of the chancel arch there is a really excellent 1521 set of brasses to John and Elizabeth Humpton and their family. 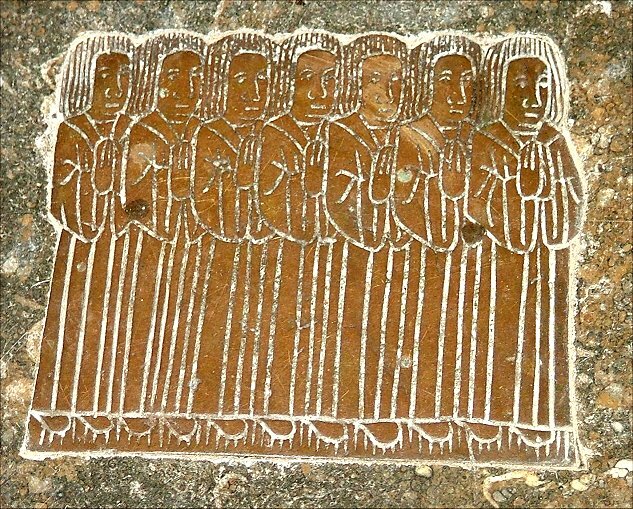 Father and mother stand above the inscription, their seven sons grouped below on one side and their solitary daughter on the other. 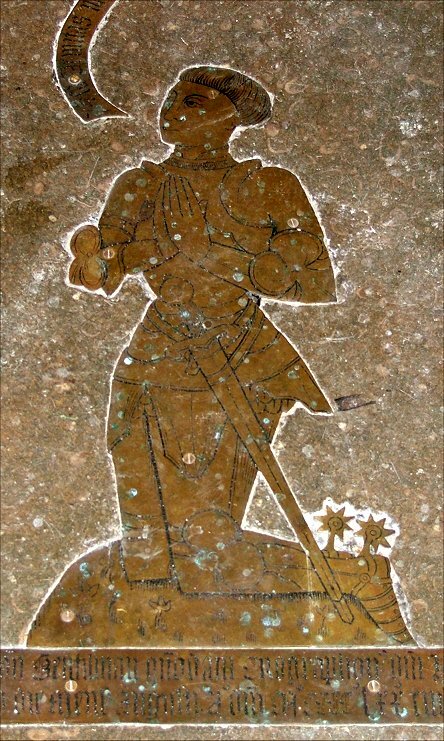 Across the nave is a brass to a knight of about fifty years earlier. 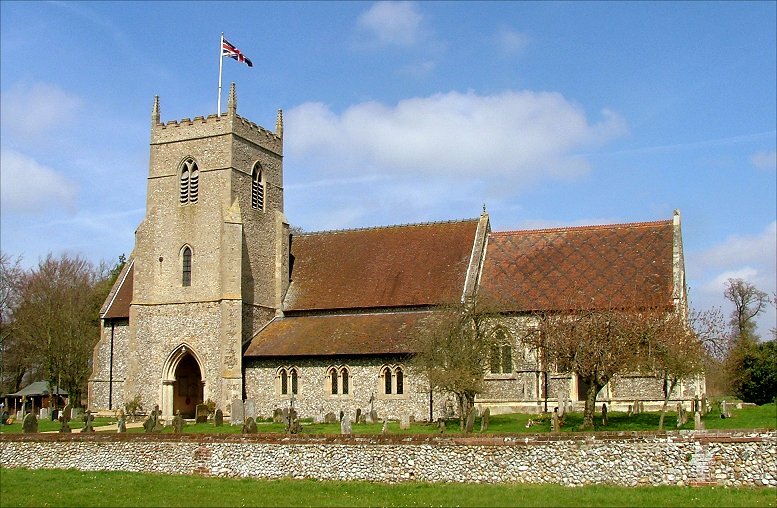 The rebuilding of the church was at the expense of the Knollys family, who were here for the building of the tower in the 14th century, and still exercise their patronage of the church today. 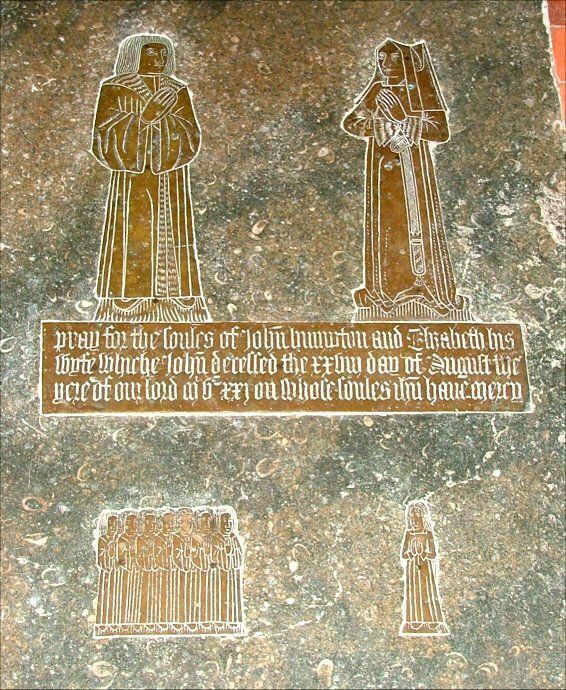 The most ornate memorial here, though, is one in the chancel to General Sir John Thomas Jones, a brass plaque set in rich stone canopy work. 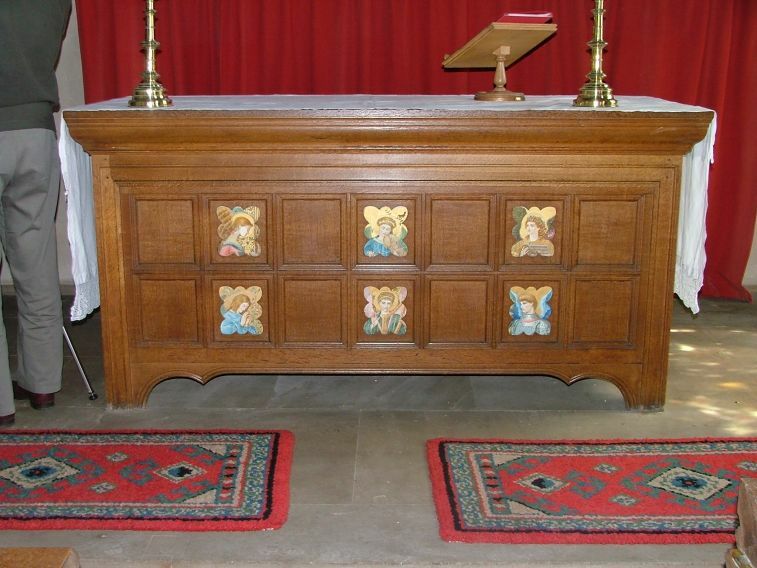 Also worth a second glance are the marquetry-worked altar frontal and the mid-18th century pipe organ that came here from York Assembly Rooms. 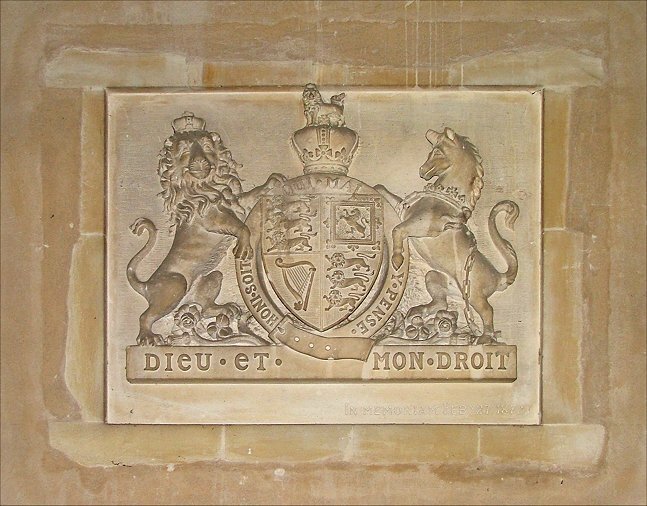 Perhaps the most unusual thing at All Saints is the carved stone royal arms set in the south arcade - or, perhaps nearly the most unusual. For there is something else. John is a more serious photographer than me, and while I waited for him to pack up his tripod I fell to musing on the main doorway. Why didn't it have a keyhole? I fiddled about with the latch, and realised that it had a curious 19th century drop-down device incorporated into it which held the latch in place unless it was flicked up. The door wasn't actually locked at all, because if the device was in place it was impossible to open the door from outside anyway. Fiendishly clever, those Victorians.